Our website has recently been updated and you found an outdated page! Please use the “BACK TO CALENDAR” link above to access our workshop calendar and find the event you would like to register for. 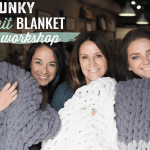 The cold weather season is the perfect time to come for our popular Chunky Knit Blanket Workshop™! Plan to join us for a ‘cozy & crafty’ DIY experience! 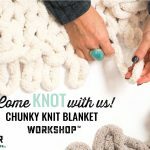 We will guide you step by step through the hand knitting process to create a super plush, one-of-a-kind blanket. Make one for you or one as a gift! All materials are provided. The blanket requires no needles or knitting experience! You will get 140 yards of chunky chenille yarn and your blanket will measure roughly 40″ x 50″. PLEASE NOTE: you will be able to make your yarn color choices at the event – some colors may be limited and are available on a first come, first serve basis.